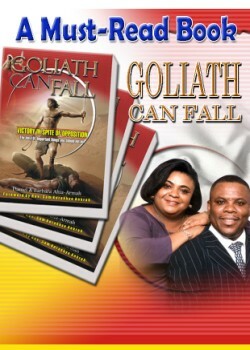 "Goliath can Fall” is an in-depth study of I Samuel 17. This famous story popularly known as “David and Goliath” vividly portrays the rise of the underdog, David and the fall of a champion called Goliath. The author stumbled upon a revelation of ten mistakes that Israel committed in the valley of Elah during this Great War. As a successful battle strategy, the above-mentioned mistakes are called don’ts. These don’ts are thoroughly and beautifully discussed in ten elaborate chapters that is simply mind blowing. This story brings a strong message home; everybody can rise from nonentity, obscurity and down the valley into a victorious superstar. This can happen in a twinkling of an eye! There are principles in this story that will shock and shake you; not only that it will establish you as a winner in all situations. Every “Goliath” in your life is about to fall. God will teach you ten (10) things you should not do for this to be possible. Come now let us feast on the word of God.